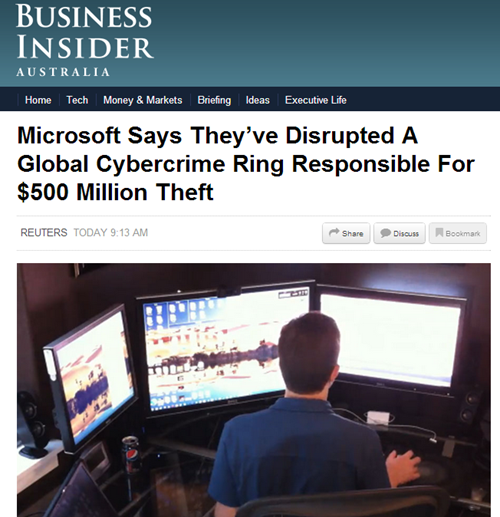 A buddy noticed a story in Business Insider Australia that was picked up off Reuters called "Microsoft says they've disrupted a global cybercrime ring responsible for $500 Million Theft." It was syndicated to OZ by Business Insider US who pulled it from Reuters, and it seems they each pick their own illustrative picture. And apparently they did it in my damn office. That's my big head, my three monitors and I am, in fact, hacking on CoffeeScript in this picture, not fighting cybercrime. How do I know? Because I was there when this photo was taken by Rob Conery. We used it for my Speaking Hacks educational video. Rob Conery and I made a video called Speaking Hacks...here's a screen capture. It got used on a post a CoderWall.com where I describe my system setup. I love that they crop the pictures they so carefully Google Image Search for. I try to use search.creativecommons.org for my image searches on this blog. Raphael Rivera turned me on to this and reminded me of the importance of respecting image copyright. Just googling for a picture and slapping it on your blog isn't cool. Usually when this kind of thing happens I'll just email a kind note to the owner of the site and mention it and it gets handled. (I've just emailed Business Insider now) Most people are very nice. Folks at Gizmodo and LifeHacker almost always have a real human behind their stories with a real Twitter account and they've always been accommodating about little things. Ah, but sometimes it's not just a nameless-faceless newspaper but it's a nameless-faceless newspaper article originally published by Reuters on "put on the wire" which means it can spread literally everywhere, and fast. Do I care? Not really, but it's the principle of the thing. I mention it because it's a teachable moment for us all. When you put an image on the Internet, it's on the Internet. It can be used for anything, anytime, by anyone. You can assert copyright, but usually depending on how big the site is (or how obtuse their Contact Us page is) you'll be lucky to find a human, much less a nice one. At least I have my hair. So far. It matters to me when it's big and public and involves my kids. Some friends were driving down the freeway recently and noticed something. They called and said "Is that your son on a billboard off I-5?" Turns out that years ago in our school's day care we signed a photo release. I assume we thought it was for their blog, or a pamphlet, but in retrospect even that was a bad idea. 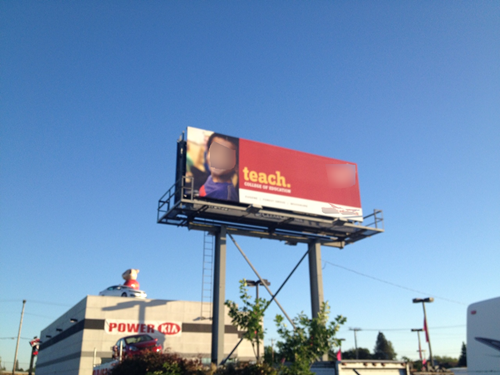 We never thought my kid would end up on a 30 foot paper billboard advertisement, with little recourse. Fortunately in the billboard case, the head of the school wasn't aware either! Their marketing folks were just pulling the photos from a shared folder, treating them as stock images. In the end, the school was extremely accommodating and apologetic and it's since been handled. Still, a wake up call to us, and I hope, to you, Dear Reader. This email showed up literally as I was/am writing this post. Thanks for getting in touch. I’m the editor at Business Insider Australia. I’ve removed that image, which was syndicated from the US edition. I’ve also alerted them to your complaint. Hope this addresses the matter for you. Awesome. And sometimes your kind letter reaches a kind human and gets handled. Thanks Paul, much respect! I think it would have been ok if from looking at the picture you immediately realized you worked at Microsoft. Could have been viewed as you were the hacker. Don't they say any publicity is good publicity or something like that? Did you ask Paul before you published his email? Thoughts on the etiquette with that sort of thing? Other Scott - No, why would I? His email was nice, I didn't publish his email address or his last name. I am little worried now, we just signed something in my three years old school to use kid's pictures. They said, its just about some school project. 'real' Scott - in general I agree with you regarding email republishing and in regard to this specific email republishing I can’t imagine Paul would have a problem with it. But I can also give some credence to an argument that goes something like: Most of the general public assume email is private and confidential (most of their email footers even have words to that affect) so emails shouldn't be re-published without consent. Hi Scott, good to hear you're promoting the commons. Did you know Google image search also allows searching for freely licensed images in advanced options? It includes freely licensed Flickr images, and images in the public domain (u.s. government works for example) alongside Wikimedia Commons. When your images being used, its good to realise you have rights of personality, alongside copyright. How much of that can be signed away(case in question, your son) I don't know, and may differ from state to state. More on rights of personality is, as always, on Wikipedia, which my phone currently makes impossible to paste a link to. As a last note, have you ever considered releasing your blog under a free license? CC-BY-SA should be a pretty good fit. As a side note, if the picture of you was taken by Rob Conery, then he most likely owns the copyright on the image, while you retain some right of personality. Other Scott might be trying to point the irony of you publishing the email, which is both copyrighted and private, in a blog post about how your copyrighted material and personal photos of your kids were used without explicit permission. My pictures turn up in various places. It's inevitable. I've licensed all of my pics under a creative commands license but it doesn't matter, people don't respect it. Its like fighting spam and you choose which battles you're going to die on. Unfortunately you can't win them all. I think the paragraph that begins with "I try to use search.creativecommons.org" is displayed twice in the post. The one in a blockquote tag is the one duplicated. What called my attention in the whole post was yours son's picture in a billboard without your consent. I will take extremely care with anything like that from my kid's school from now on. I was wondering your reaction (and to the folks with you) when you noticed that! I don't like this general view of "it is on the internet, so I can anything I want it with it". I don't know where it come from, since we do not have something like "it is on the bookstore, so let's use it because it is public". It is just too egoistic and sounds like people never heard about words like "ethic". That's why every photo I post on the web has it's copyright REGISTERED first! $15K/Violation. 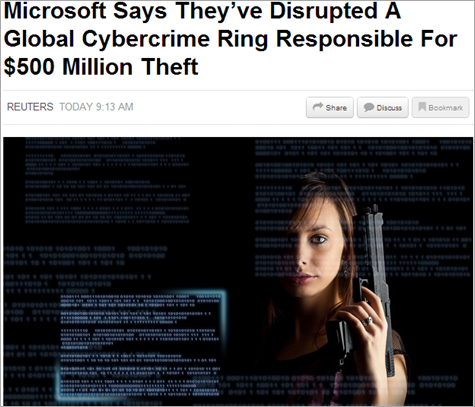 Ironic that an article on cybercrime is committing a cybercrime, n'est pas? Scott, it was very accommodating of them to take down that image on your request. Usually take-down requests need to come from the copyright owner, which in this case would be Rob Conery, unless he signed copyright ownership over to you. Did you cut a deal for product placement in your original photo ? There is a can off to your left. It's also worth noting that you should be careful with giving permission or making an image available with creative commons even when it's attributed to you correctly. There is a photo on Flickr of me screaming into a headset (it was taken as a joke). The photo was posted under creative commons and I let Business Insider use the image when they asked. It's now become regularly used when an 'angry nerd' is needed for an article. Since they've correctly attributed it to me, it's now one of the top image search results for 'Ian Muir'. For me personally, it's not a problem as I find it funny and they have both asked for permission and correctly attributed to me. However, it has come up in job interviews since, and I can imagine the some people would find it embarrassing. If you don't want to be associated with an image, don't let sites use it, the Google knows it was you. I haven't had any of my images pop up anywhere, but I did have a blog post used. I had a problem with something and had posted steps to resolve my issue on my blog. Later I saw the exact same steps posted by a Microsoft support person in a forum with no link or anything. I was at the same time angry that my work had been taken without attribution and excited that I was helping even more people. Thanks for the pointer to search.creativecommons.org, I didn't even know that existed. Great post by the way. If I saw a photo of my child on a billboard without my specific permission, I would go NUTS. Sveder: Once an email is made available to a third party (ie Scott) it is no longer covered by any privacy statutes, at least not here in the US, regardless of any of those inane "legal" footers. Not sure on copyright law, but considering that attribution was given with the use, that is probably OK, too. I have yet to be mugged at gunpoint by my computer. However the photo they used show's horrible handling of a firearm to boot. I wonder if that is a stock photo or one that was pieced together from images on the web. Typical Rafael. I don't see what the big deal is. My joke above doesn't work without the right gravatar image. Dammit. They should have used Luvvie in the new pic! Scott (real Scott) sometimes you can be sooooooooooo nice about stuff. Your blog article has 0 venom or bile. You were not even upset! These guys should have (mis) used the picture of a more "effervescent" person. Thanks for reminding us about what we put out on the interwebs. Scott - My comment follows on from the other Scott's. There might be some (unintended) hypocrisy going on here. Privacy is privacy - just as you should have been asked for permission to use the back of your head (which doesn't identify you), you should get permission before posting people's emails to your blog. In fact, there is much more info in that email snippet than in your photo; Paul at Business Insider Australia is pretty unambiguous (unless everyone in their office is named Paul, which is unlikely) whereas the back of your head doesn't say much at all. In any case my comparison about how much information is leaked is an aside. The key issue is that privacy is privacy - in your response to the other Scott you rationalized your decision to post the email, but you have no idea what concerns the sender might have, or what circumstances might be in place that could make such an action harmful. As there is even a sliver of uncertainty regarding this, the sender should be asked for permission before posting. "Sometimes you need to monitor the progress of many projects. "Jedi lightsaber must create their own, do not you?" He is called Scott Hanselman, hacker said. All the things that are on the table of his own design, including two powerful computer." My wife (an artist) has severe problems with image piracy on the web. She spends considerably more time dealing with DMCA takedown notices than she should, seriously detracting from the time and energy she has to create new work. I am certainly appreciative of you sharing your experience as it provides a forum to draw attention to this problem to an even wider community, and I suppose it is good that you posted about this even though you were not necessarily personally hurt by it. Yes, theft is still theft, even if it is digital. It is a serious problem that far to few take seriously. Raphael Rivera ... reminded me of the importance of respecting image copyright. Just googling for a picture and slapping it on your blog isn't cool. There are a few billion people who I wish would follow your lead. Great post. Important to understand both sides that if you post something it is out there for good. Also important to realize as a person looking for a picture to use to have some respect when choosing. I don't really understand what the big deal this is about? When you put code out there you don't care what it is used for and you feel good that someone is using it. However when they take your images you send them Take Down notices ? i'm not sure if this is legal; IANAL; it's somewhat the reverse of what *THIS* blog describes -- Collingwood Walmart had a photo deal ~~ a gazillion photos for $9.99 that seemed too good to be true. Ah ha, thought i, i can update my avatar ... however, i was told if i wanted to use my own picture online, i'd have to pay a premium (likely because Walmart needs the money, not because Walmart might be greedy) ~~ bottom line: i did not do it. FWIW, Microsoft Office a few years ago had a CD with about 2000 photos; AFAIK, they can be used for any reasonable purpose (IANAL); that CD shipped as part of Office Premium if my recollection is correct. BTW, Scott, thank you for pointing us to http://search.creativecommons.org. Copyright law is very complicated and varies from country to country ~~ the fundamental principle of "fair use" is itself debatable. Editor Paul: "May i use your photo?" Scottha: "Yes, but only if it's okay with R.C." Which is the bottom line, imho: we need to learn FIRST to ask permission as a courtesy (rather than after we've been outed). I know the feeling! My husband, who writes software, sent this link to me, as he knows I've battled infringement pretty regularly. Doing reverse image searches and sending DMCA takedowns was so time consuming that I had to change the way I market my artwork online. It has cost me money but the time and energy it has taken cuts into productivity, too. And since dilution of value of art images is just more loss, I can't ignore it. As for Creative Commons or any other org offering 'free' images, or even images you pay for that are supposedly copyright free: be wary of their promises. People do offer images they don't own to these licensing orgs. Then anyone who uses them is subject to takedowns etc, the same as if they'd infringed it. Thanks for posting about this, I can imagine how it made you feel! Matthew, we'll have to agree to disagree. Email has no expectation of privacy. @Scott - It was a directed, 1:1 communication! Hi, I do believe this is a great site. I stumbledupon it ;) I will come back yet again since I book-marked it.